Spring Break has come and gone and my little family is gearing up for our own 2019 vacation! This gets me so excited and inspired to share my experience, knowledge and tips for flying with a new baby with all of you! Emma is not considered a baby anymore (insert crying face!) and it’s already wild to think back and remember her first few flights. The preparation, the planning, the nerves… It’s already so much different! Take any negative comment you’ve heard about flying with babies and throw it out the window! People have told me their horror stories of blow-outs and screams throughout the entire flight; getting dirty looks and feeling judged. Let me assure you, MOST people are so helpful and so happy to see our sweet babes faces on the airplane. You'll hear coos and awes and things like, "I have a little one waiting for me at home" or, "I've been there before!" or, "my baby is already 25!" You probably hear that last one daily! I would always try and pick flight times that worked best with Emma’s nap schedule and the majority of the time it worked like a charm! Parents of kids know that a well rested child is generally a happy one and our biggest fear is having a screaming baby for the entire duration of a flight. Most infants who are on a sleep schedule have… 2-3 naps a day? So, I would plan around that. In a perfect scenario, Emma would nap for our drive to the airport, again on the flight, and possibly again as we drive from the airport to our destination. Most of our flights were from Denver to Minneapolis so it was a perfect 1.5-2 hour nap for my love. If the flights were longer, like for our trip to Saint Lucia, she would nap the majority of the way so we only had a couple more hours to entertain her. TIP #2: DON’T FORGET ID FOR YOUR BABE! IF YOU NEED IT. 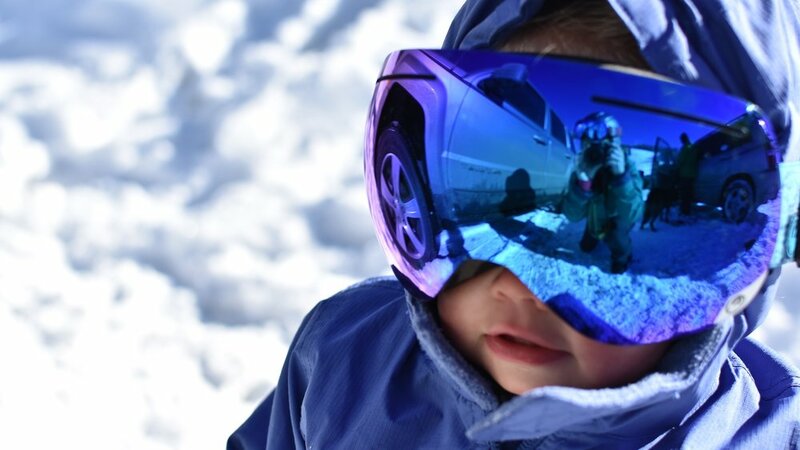 How are you planning on flying with your baby and where are you going? Are you going to buy them their own seat or have them sit on your lap? Are you flying domestically or internationally? If your child is under the age of 18 and they have their own seat, you should not need any form of ID. You will need identification for your child though if they are on your lap because kids under the age of 2 can fly for free using this method! The airline needs proof of age to verify and a birth certificate should be all you need if you are flying domestically. You will need to check in and print your boarding pass upon arrival so that the airline attendant can verify your baby’s age and add them to your boarding pass as a lap child. You can’t do this when booking online or on the phone so remember, don’t bring your lap child to security before doing so! If you are flying internationally, then you will need to have a passport for your baby no matter which method you choose to fly them. If you do get your baby a passport, both parents must go in person to obtain the documents so plan that appointment accordingly. When we were getting Emmas, there was one angry mama complaining after the clerk informed her that she’d have to come back. Don’t be that person! If your child only has one parent then contact your passport registration office and ask. TIP #3: KNOW WHAT YOU CAN BRING ALONG… FOR FREE! Most airlines allow children under 2 years old to fly domestically for FREE as long as they sit on your lap! Take advantage of this those first couple years! The younger they are the easier too. If you prefer them to have their own seat, some airlines do offer small discounts on that extra seat if the child is under 2 - Delta being one of those so give them a call to inquire. Most other airlines will have you pay full price but the FAA does recommend it for turbulence safety reasons. Whichever way you choose to fly, don’t forget that you have so much more you can bring along than you think! Most airlines let you check a stroller and carseat free of charge! Sometimes you want to bring your carseat because you’ll need it at your destination. This has always been the case for us and I have also always had Emma sit on my lap. I recommend getting a car seat travel bag with arm straps to wear as a backpack, wrap your carseat up, sneak a pack of diapers inside, and check it upon arrival with any other checked luggage! Makes it SO much easier while walking from the parking lot to the airport. Plus, you can sneak a few extra items inside. Yass! :) If you plan on checking your carseat then I recommend THIS TRAVEL BAG from Amazon. Its durable and cushioned so you can have better peace of mind that your car seat is safe. You can purchase stroller bags too but I personally think it’s a waste of money. I have brought our stroller many times and I’m pretty sure the majority of them collapse nicely for a quick gate-check. If you have a stroller/car seat travel system you can check them BOTH at check in and wear your baby to the gate in your favorite baby carrier or, you can stroll them along the whole way and check the entire system at your gate! The stroller can also assist with holding the diaper bag or your cellphone and water which can be sooo nice especially if you have carry on items in addition to everything else. If I am by myself, I do prefer bringing the stroller. A baby carrier is my top choice if I’m traveling with someone else who can lend a helping hand. The fewer things you have, the better! Diaper Bags do NOT count as a personal item so you can bring it on free of charge! All airlines allow you to bring a small personal item on board such as a purse or laptop bag. Some also allow a free carry-on that you stow away in the overhead space - check with your airline first because most charge you for this. As a parent with an infant you can ALSO have a diaper bag without worry of an additional payment. Woot-woot! Pro tip: If you do bring your stroller to the gate, leave your bulky jogger at home. Some airlines aren’t allowing strollers heavier than 20 pounds to be gate checked anymore due to safety concerns for their employees. It was a huge bummer for me when American Airlines took my stroller when I was traveling by myself with Emma… and a diaper bag and a carry on and my purse. I was weaning Emma when our flight was cancelled overnight in Charlotte, North Carolina. My hand pump was packed away in the checked luggage (which you don’t get back for an overnight flight cancellation) and it was a disaster not having it! Our friends who were with us? They only had enough diapers for the plane ride in their carry on so they had to figure out where and how they could purchase extras. BAHHH!! If you had to imagine your flight being cancelled think of what you would NEED to make it through the night and pack that on your carry on. Extra shirt for you and babe, extra formula, extra diapers…. think about it! The airline will usually provide a toiletry bag with deodorant, toothpaste/brush, comb, etc so you don’t have to worry too much about those kinds of items. Just the other necessities. A floor blanket. Pack a light blanket or two for the airport floors. Floors are kind of gross there, to be honest everything at the airport can be filled with nasty germs, and your going to want your baby to stretch out at some point before your flight and while waiting at baggage claim. You’ll probably want a blanket for on the plane too. Speaking of dirty airports, EXTRA WIPES! I wipe down everything on the plane that I think Emma would touch, or even myself for that matter. I’ve known too many people who have gotten the flu or a nasty cold from the airplane and no one wants to be sick while away from home. A fun new toy and a couple lightweight books. 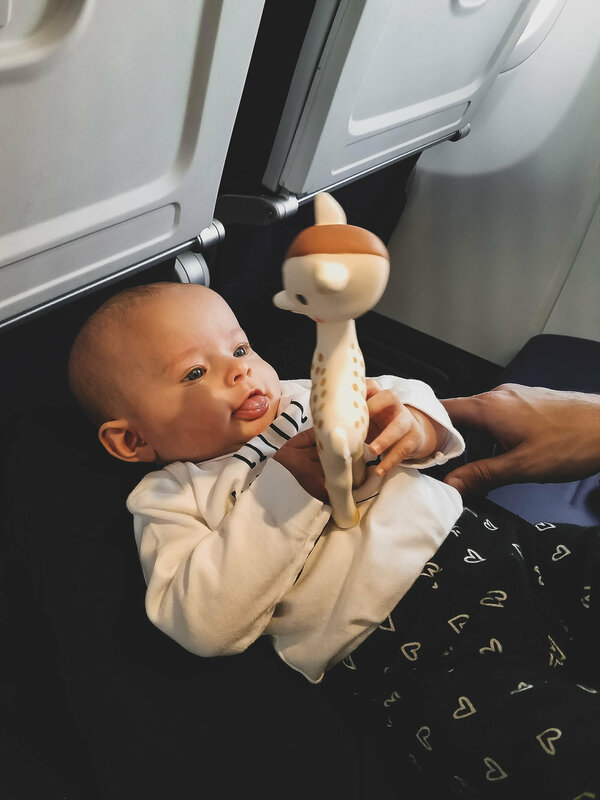 Whether your fun new toy is a book or stickers or an actual toy (all of the above depending on length of the flight), I always try to make sure they’re totally new so baby is stimulated in exploring and having fun with them. We loved bringing stickers and Emma’s teething toys. A pacifier leash! Man, we didn’t bother with these until we wished we had after a flight. Both my husband and I thought they were a waste of money but no way! They are great for securing the pacifier and smaller toys so you’re not constantly bending over picking things up or wondering where they rolled off to. SNACKS and/or a NURSING COVER. If your baby is eating solids, don’t forget to bring lots of snacks. If they are still nursing or bottle feeding, you CAN bring breastmilk and formula on the plane. Check out THIS PAGE from tsa.gov for a quick video on going through security with your infants’ needs. I’m sure you’ve heard this one before but it’s true! The pressure can effect your ears and you’re going to want to protect your babies as well. Nurse or bottle feed upon takeoff to help with that pressure change or, if they aren’t hungry, pop in a pacifier if they’ll take one. If not, try not to fret! There was one time that Emma had to eat before we boarded the plane and she fell asleep just before takeoff. I was so nervous that her ears wouldn’t normalize and she’d be a sad baby once she woke up. She was just fine! Better safe than sorry though! Tip #6: YOU WILL SURVIVE THE PLANE RIDE! Poopy explosions, screams, and all. Just try to remain calm. Those instances are more rare than you hear and plus, you’re a capable and smart mama! Dirty diaper? You have changed a ton of them in your own home by this point. What Makes this any different? Because someone might smell it? It could’ve blown out and gotten on your shirt? The seatbelt light is on? Again, you do this everyday at home and YOU’VE GOT THIS! Just take a deep breathe and remember that you’ve already packed a change of clothes (incase of a flight cancellation;) and that most people on the plane are on your side. Grab your diaper bag that’s under your seat and head to the nearest restroom. The restrooms are TINY but they have a changing table that opens over the toilet. There are usually a couple restrooms on the plane so don’t fret if one is occupied. It’s that easy. PRO TIP: If the diaper is not a blow out, I recommend only bringing the necessities to the restroom- changing pad, diaper, and wipes. Same goes for screaming babies. They fuel off of your energy. If your baby is going nuts then try to relax and think about what you would do at home. You know… the checklist: Wet Diaper? Hungry? Tired? Gas?… etc. YOU’VE GOT THIS! Tip #7: ACCEPT HELP EVERY TIME IT’S OFFERED. Like I mentioned in the intro, most people are on your team and are stoked on seeing a sweet baby. Many times they offer to help you out in various ways and especially if you are a solo parent traveling. LET THEM! Let them put your carry-on in the overhead compartment, let them fold your stroller up upon gate check, let them allow your babe to watch Sesame Street on their tablet. Sometimes we feel like this is our responsibility and that we can physically do it all on our own and while that is TRUE, it is so much less stressful and simply just more freeing to let go a bit. Allow your new and temporary village to come to the rescue. On this flight Matt and I both had isle seats and it worked out better than I thought! There are SO many things to consider when flying and traveling with a baby and if you have any questions or recommendations requests then please ask away! If you have other fun tips to add then please, add away! You’ve got this mama!